THE AMERICAN CIVIL LIBERTIES UNION is a nationwide, nonprofit, nonpartisan organization dedicated to the principles of liberty and equality embodied in the U.S. Constitution and the laws of the United States. This report focuses on one urgent issue: the accessibility of online voter registration websites for voters with disabilities. 1. It is a good idea: People with disabilities constitute 19 percent of eligible voters.5 Those most likely to experience barriers online are people with visual disabilities, cognitive disabilities (such as traumatic brain injury), learning disabilities, and limited mobility of arms and hands. For many, online registration would remove the need for a time-consuming and burdensome trip to the Department of Motor Vehicles. 2. It is the law: Title II of the Americans with Disabilities Act (ADA) requires all state and local government entities to ensure that people with disabilities have equal access to government programs and services. The ADA also requires equally effective communication.6 An online voter registration system is such a program and service, and the information it communicates must be equally available to people with disabilities. It allows people with visual disabilities to use screen readers, which translate the text and navigation features on the website to speech. It allows people with limited hand or arm mobility to navigate the site without having to use a mouse, but through the use of a keyboard or voice commands. It provides people with hearing disabilities, or certain processing disabilities, with a written version of auditory content. 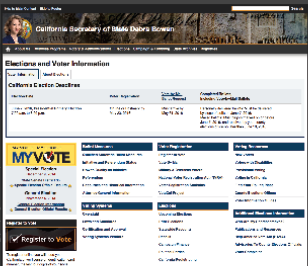 The bad news: Only one online voter registration site in the country—California’s—is fully accessible to people with disabilities, and most state sites do not meet even minimal standards of accessibility. This report lists the most common problems, ranging from issues that completely bar a user with a disability from being able to access the site to issues that pose significant hurdles to use. 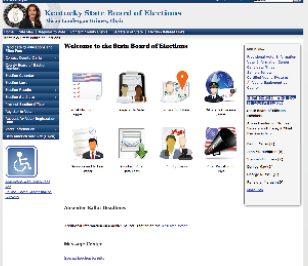 On all but one of the state sites reviewed, the most important portion of the website—the online voter registration form itself—was inaccessible to people who use screen readers. (Screen readers are a simple technology that translates text to speech for people with visual disabilities, dyslexia, or other cognitive disabilities.) Because the forms were not properly coded, people who use screen readers would find it difficult or even impossible to know if information such as their name or address was entered into the proper fields. This report is a tool for election officials and computer programmers to design accessible voter registration websites. 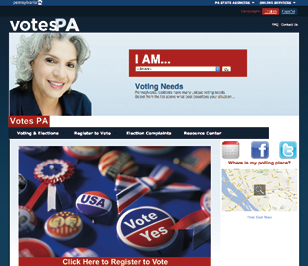 It details common errors in online voter registration sites and highlights best practices for website designers. It includes both basic information for the lay reader and detailed instructions for the expert coder. Making websites accessible will improve the voting process for everyone. Moreover, at least one study has shown that making websites accessible will enable states to save money.9 By implementing the recommendations included in this report, states and localities will ensure that all eligible voters will have the opportunity to participate in our democracy without unnecessary barriers. Historically, people with disabilities have faced enormous barriers to exercising their right to vote. Inaccessible polling locations and voting machines—as well as wholesale disenfranchisement of people with certain types of disabilities—have discouraged, and at times prevented, many citizens with disabilities from participating fully in the voting process. The Help America Vote Act (HAVA) of 2002 moved the United States a giant step forward in removing barriers to the vote. With the requirement of accessible polling places and accessible voting machines, HAVA promised full access to the ballot for people who had previously been unable to vote privately and independently. The ADA has also established the clear right of people with disabilities to equal access—especially equal access to government services. Title II of the ADA requires state and local government entities to ensure that people with disabilities have an equal opportunity to participate in or benefit from all government programs, activities, and services. To fulfill this mandate, governments may need to make reasonable modifications to policies, practices, or procedures, or provide auxiliary aids and services. In short, state and local governments must ensure they are not creating barriers—even unintentional ones—for people with disabilities. The Internet plays a central role in connecting Americans to information, government services, and opportunities for civic engagement. Just as physical accessibility means that people with disabilities can reach a sidewalk using a curb ramp or enter a building with an automatic door opener, web accessibility ensures that people with disabilities can perceive, understand, navigate, and interact with digital information. As more of the political process moves online, state governments need to ensure that people with disabilities are not left behind. When the web is accessible, many people with disabilities can communicate, interact, and participate online more easily than they can in the physical world. Online voter registration can, if done correctly, be an enormous service to many people with disabilities. The spectrum of disability experiences is extremely broad. The following is an overview of some of the most common barriers people with disabilities experience in using the Internet. While not comprehensive, the review should provide a basic understanding of the usual ways people with disabilities can best access the web. People with visual disabilities are generally divided into two groups: those with limited vision (“low vision users”), and those with no vision (“blind users”). 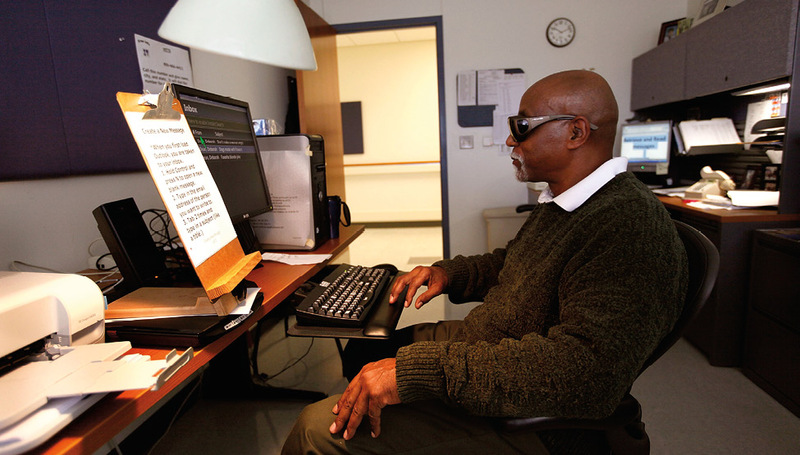 Both groups are legally blind, and both may use a computer with different types of assistive technology. 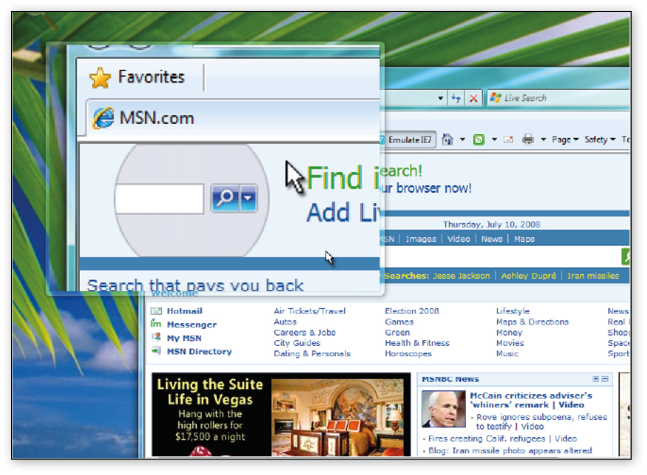 Most low vision users rely on enlarging the images and text on their computer monitor to see a website. To do this, one can set the print size to large or use screen magnification software. It is not uncommon for a low vision user to need to magnify the screen so that only one-sixth or one-eighth of a typical screen is visible at a time. Much of an enlarged screen is out of view, so a user must move the screen around to see all of the text. Setting the screen to this level can make the text readable, but it can be very disorienting and hard to navigate, with these users often “swimming” around the screen, trying to find key content. Screen magnifier software makes the screen visible for people with low vision, but the screen can show only a portion of the webpage at a time. Long lines of text. These require scrolling many “screens” across to read and then traveling back to start the next line. This makes it hard to find the start of the next line, as it is often far off screen to the left. Inconsistent placement of navigation items. As low vision users can see only a small portion of the screen at any one time, they often have to hunt for navigation items, especially when they are not placed in standard locations. Inconsistent placement of key interface elements. If critical information, such as form “submit” buttons, is placed in the far right corner or the bottom of the screen, it makes the buttons difficult to locate. Moreover, screen magnification users often miss content on the right side of the screen. Critical information should be in the left or middle area of the screen instead. Blind users generally access computers with screen reader software. Screen readers convert print on the screen into a spoken, synthesized voice. (Screen readers can also connect with machines that translate the text to Braille for those who read Braille, but a synthesized voice is more commonly used). Screen reader software has the potential to allow a blind user access to everything on the web. However, it relies on the web designer to build the site in a way that the screen reader can “read” the information. Screen readers are extremely smart—but they are not “mind readers.” They can read text and code, but they cannot read images. So, for example, a screen reader cannot translate the contents of a photograph or a map. It cannot even read the words “Secretary of State” if they are part of an image and not text. The header for the Minnesota Secretary of State’s webpage is an image. 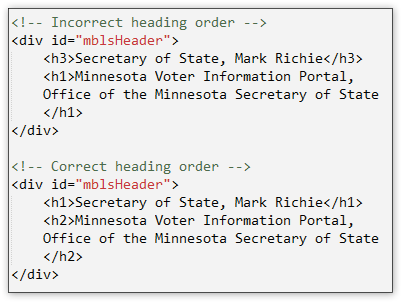 It includes Mark Ritchie’s photo, the state seal, and the words “Office of the Minnesota Secretary of State Mark Ritchie.” A screen reader cannot read the photo or the words in it. But it can read an “alt tag” describing the image in text so that the user understands the significance of the image (the “alt tag” is shown below in green). Images that are unlabeled. These are therefore unreadable by the screen reader. For example, on a form in which the “submit” button is an image, the screen reader cannot convey to the user what the button does, and therefore the user will not know how to submit the form. Unless that image is properly labeled with text for the screen reader, it is useless to a blind reader. Websites that require the use of a mouse. Because blind users cannot see to move a cursor on a screen, they typically use only the keyboard for navigation. Many websites do not permit keyboard users the same access to the site’s functionality. Some sites use keyboard shortcuts that interfere with screen readers’ keyboard commands. For example, if a website has the image of a map and tells the user to click on a county, it may be impossible for the screen reader to find the point on which to click. Websites that are poorly designed and structured. Using a screen reader can be tedious without good design. A sighted user can see an entire webpage within a few seconds, focus on the area of top interest, and click directly on that section to proceed. Blind users cannot do that. Instead, they have to listen as the screen reader reads through what is on the screen from top to bottom. 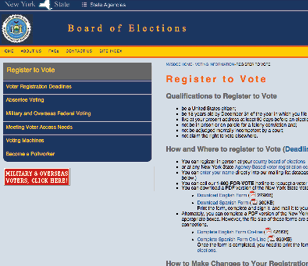 The page heading is properly coded so that the screen reader can convey that the user is on the Ohio Voter Registration page as opposed to the New York Voter Registration page. The contents of the page are quickly and easily located. The form fields are labeled so the user knows which box to type in each piece of information. 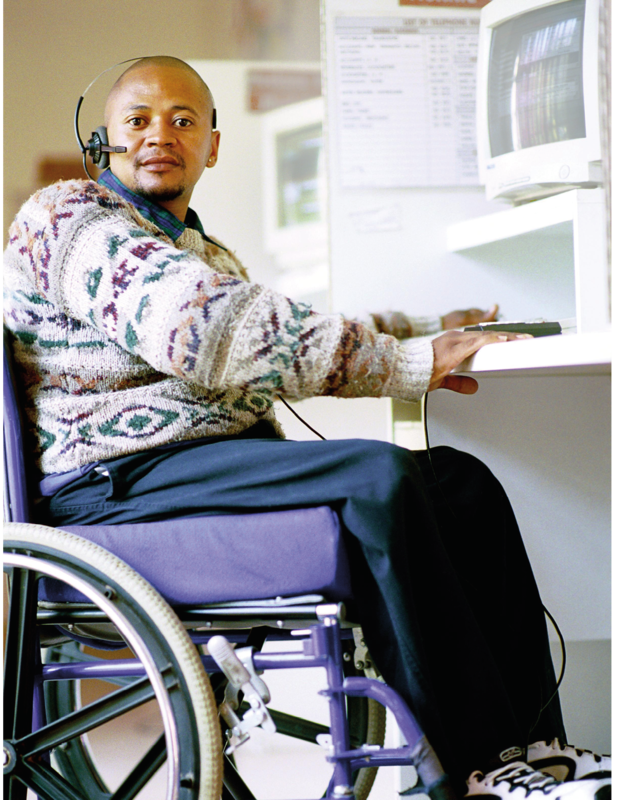 People with upper-body mobility disabilities range from those who have mild difficulty with fine motor control, making the use of a mouse difficult, to those who have no use of their arms or hands at all. For many, using a keyboard and mouse presents a challenge. 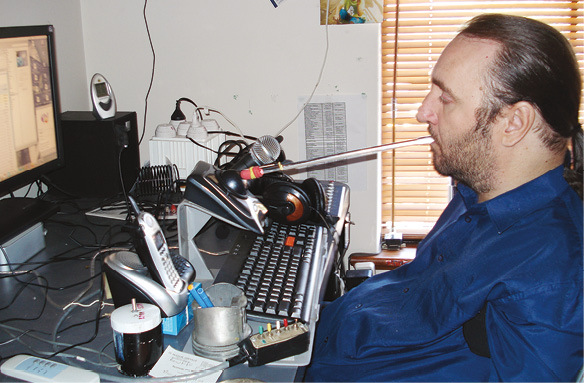 Some people with limited mobility in their upper body use mouth sticks to use a computer. A mouth stick to control their computer. Voice recognition software that allows them to use their voice to direct their computer’s keystrokes. A keyboard only (without a mouse). Basic aspects of accessible design for these users include minimizing the number of clicks needed to get to key information and organizing a site’s contents in a logical manner. 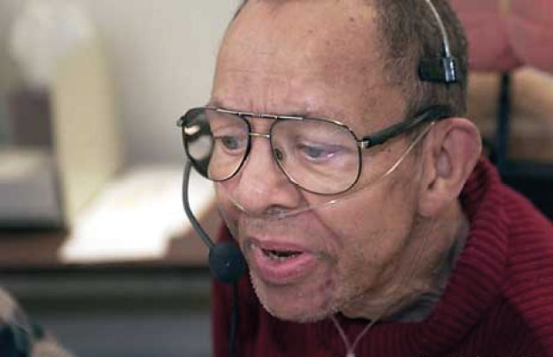 Speech recognition technology allows people with hand or upper-body limitations to use a computer through verbal commands. Here, Vernon Cox, who has had quadriplegia since childhood, uses speech recognition technology instead of the mouth-held typing stick he used in years past. People with cognitive or learning disabilities are the largest and most diverse group of people with disabilities who need access to the web. Such individuals may have difficulty processing written language, images, speech, or numbers. Cognitive disabilities include autism, Down syndrome, traumatic brain injury, and dementia, while learning disabilities include attention deficit disorder, dyslexia, and dyscalculia (difficulty with numbers). To access information on the web, people with a cognitive or learning disability may use several technologies at the same time. Someone who has difficulty reading may use a screen reader that highlights text plus synthesized speech to facilitate comprehension, while someone with an auditory processing disability may use captions to help understand an audio track. This is an example of the use of a combination of illustrations, graphics, and text to communicate key ideas.11 Many people with cognitive or learning disabilities benefit from this approach. 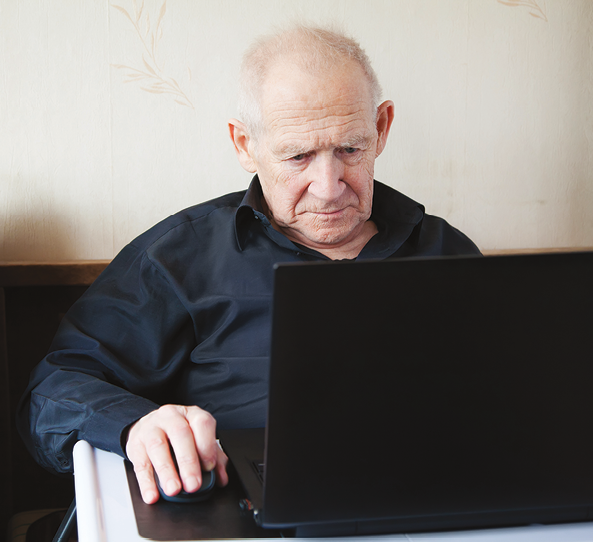 Many people who do not identify as having a disability are also affected by inaccessible website design, such as seniors, people with limited English proficiency, and people with limited literacy. Seniors often experience a loss of mobility, limited eyesight, and minor cognitive issues. They also tend to have less experience with using the Internet and navigating a website. People with limited English proficiency or limited literacy may find complex words and sentence structures challenging. Use interface elements that are supported by pictures, icons, or symbols. Have a consistent layout for the site with unique page titles. A website that is well designed for people with disabilities will be a website that is easier to use for everyone. A well-designed website is an accessible website. This section of the report provides an overview of how the states fared. Of these, California’s online voter registration site was the only one that passed all the tests. A brief look at the remaining 14 states with online voter registration showed similar access issues repeated over and over again. The results of the review provide both good and bad news: The bad news is that state governments are, as a whole, doing an abysmal job of providing fully accessible voter registration websites to the public. The vast majority of states that have implemented online voter registration are inadvertently barring people with disabilities, and screen reader users in particular, from making use of this new approach to voter registration. Overall, the accessibility of online voter registration is quite poor, and virtually all of the websites that CforAT examined have significant barriers that would make the sites unusable for many people with disabilities. The good news is that the majority of the access barriers are quite easy to correct. Most of these websites can be brought up to decent accessibility standards without great expense and within a fairly short period of time. Of the six states that the Center for Accessible Technology reviewed in detail, the accessibility ranged from beautifully accessible (California) to extremely inaccessible (Missouri). With the exception of California, all the states failed the most basic form of accessibility: access for screen readers. 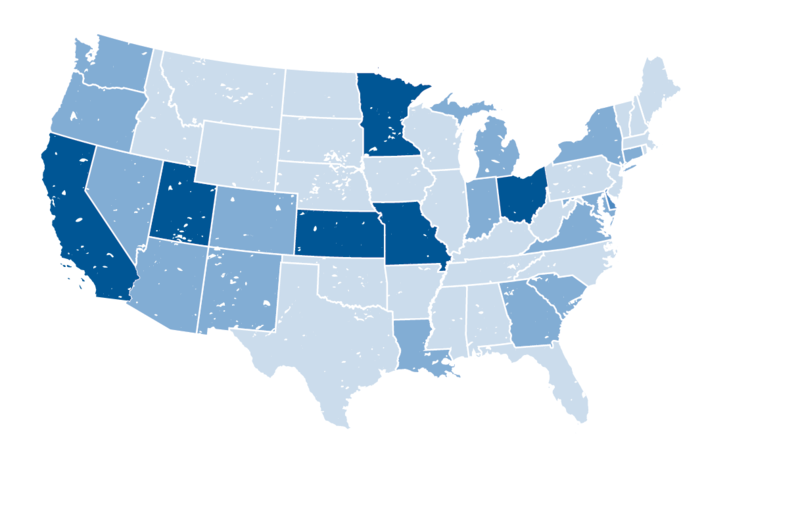 States routinely failed on “skip navigation,” which allows users relying on accessible technology to navigate a webpage quickly. Less frequently, but importantly, some states also had challenges with “text scaling.” This allows users to change the size of the text on the page and is especially important for low vision users. In particular, Missouri failed to provide a logical “tab order.” This refers to how the cursor moves when the user presses the tab key, and it is an especially important feature for users who cannot use a mouse. The most troubling barrier, however, given the purpose of online registration sites, was the inaccessibility of the actual voter registration forms. State sites also had barriers to navigating through the site, understanding the images on the site, and being able to see the text clearly. Note: The access issues listed above are explained in greater detail in the following section, “Access Issues Explained.” Any state that failed the forms test automatically failed the screen reader test. The Center for Accessible Technology also evaluated the sites for usability issues. These factors are less commonly considered as access issues, but they can make a big difference for people with cognitive or learning disabilities, seniors, people with limited literacy, and people with limited English. Alternate methods of voter registration. 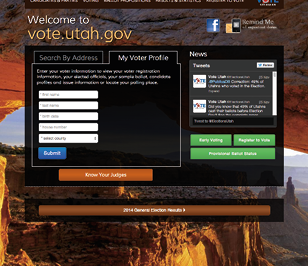 Providing information on how to register to vote by mail or in person is useful if a user is unable to register online. Means of contacting support. Providing a way for the user to contact someone by phone or email can be helpful in case of problems registering online. Accessibility statement. Some websites have a statement explaining the efforts the state government has made to ensure website accessibility, with contact information for assistance should someone encounter a barrier. The table below summarizes the results of the usability issues tested. Boxes coded in light blue scored well, while those in dark blue scored very well. Boxes in red scored poorly. White indicates a borderline score. Again, California modeled the best practices, with a high readability score, multiple languages, and options for users who may have encountered problems on the website. This section provides more detail on the most common access barriers for online voter registration. It is intended to be helpful to the lay person as well as to programmers and website designers. We have made every attempt to explain the issues in plain English. If terminology is still confusing, however, please consult the Web Accessibility Glossary (Appendix A). The most important portion of an online voter registration site is the form a citizen fills out to register. If a citizen is unable to fill out the form, he or she will be unable to register to vote online. Unfortunately, forms have a number of common accessibility barriers affecting a wide range of people with disabilities. Forms can be particularly inaccessible for people using screen readers. 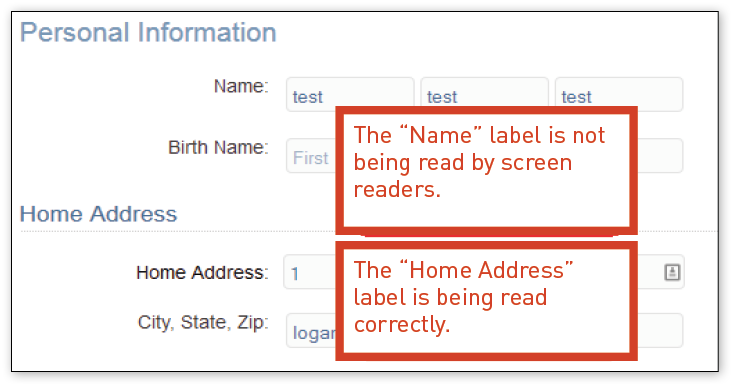 Forms have to tell screen readers not only what information is required (e.g., name, address, date of birth), but also where that information should go and what to do if there is a mistake. For example, Utah’s form was inconsistently coded. 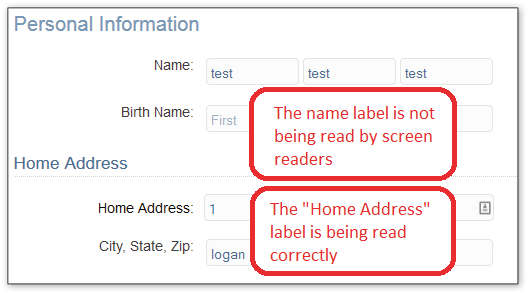 As a result, a screen reader is unable to read where a citizen’s name should go, even though where the address should go was coded properly. As you can see from the screen shot in Figure 1 below, it is not often clear from the look of the screen alone whether the form is accessible to screen readers. In Utah’s form, the “Name” text cannot be read by a screen reader. There were also barriers if a citizen made a mistake filling out the form. The messages that alert the user to the mistake, where it is, and what needs to be fixed were not always accessible to assistive technology, or they were difficult to find and understand. In most cases, creating a form that is accessible to screen readers is well within the skill level of the people who designed the existing sites. However, creating a form that has accessible alerts when errors occur, and an accessible means of form validation, can be tricky. Fixing these problems may require additional support. Semantic coding, or semantic HTML, is a means of coding that reinforces the significance of any portion or text of a website. It prioritizes the headings and subheadings in order, making it easier for those who use screen readers—and everyone else, for that matter—to be able to navigate to the relevant information. Using semantic HTML makes webpages work better with assistive technology. It provides proper heading structure, groups related items into ordered or unordered lists, uses data tables for presenting information in a tabular format, and uses proper HTML elements for controls. This is especially important for assistive technology that works with the underlying code of a website (such as screen reader software), and it also allows the website to be compatible with assistive technology that may become available in the future. People who use screen readers have a much easier time finding relevant content in well-structured pages, but ultimately all users benefit from semantic markup. Heading structure, one of the most important aspects of a webpage, was a particular issue for the majority of states. Screen reader software reads heading structures, which allows users to jump from one heading to the next depending on what they want to read. Headings therefore not only allow users to navigate more quickly, but also provide blind users with a hierarchical representation of a page’s content. The Center for Accessible Technology reports that many people who use screen readers rate heading structure as the most critical component of a website. Ohio’s webpage needs HTML headings. California and Utah both scored well in this category. Figure 3 provides a screen shot of California’s heading structure with the coding revealed. A screenshot from California showing proper use of heading structure. It is very easy to correct poor or absent heading structures. Unique, descriptive page titles are essential for screen reader users. It is the first item the software reads aloud on a webpage. The page title orients users within the site, lets them determine if a link they clicked on took them to the desired location, and lets them know if form submissions have resulted in errors. In addition, page titles are the default titles shown in search engines and are used when pages are bookmarked, so descriptive titles are essential for helping all users find the content. Figure 5 shows a page title from Ohio. 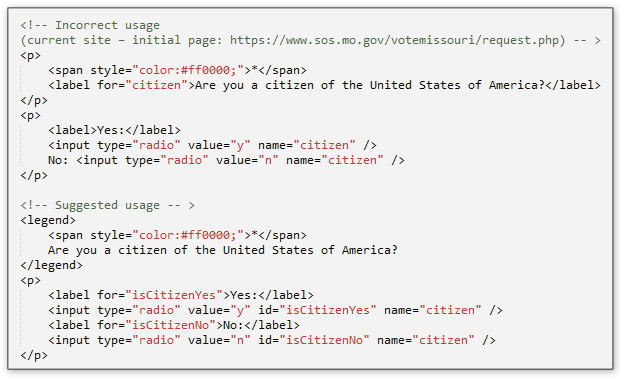 While it tells the website user that he or she can register to vote, it neglects to tell him or her what state he or she is attempting to register in. This Utah page shows how to properly title a webpage. Ohio’s page title is incomplete. Without the state name included in the title, someone using a screen reader could be trying to register to vote in the wrong state. It is very easy to correct poor or absent page titles. Skip navigation is an important tool for people who are unable to use a mouse and for people who use screen readers. Most websites have navigation systems with multiple links down the left side of the page and/or along the top of the page. For example, in Figure 6 below, the Kansas Secretary of State has an image at the top of the page and many links down the left side: Home, About Us, Business Filing Center, etc. 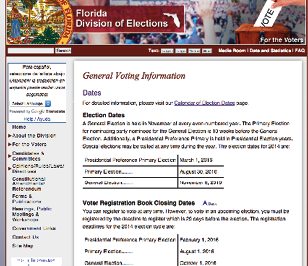 Information on Registration and Voting is on the center of the page. For sighted individuals who use a mouse, it is quick and easy to skip the links on the left, turn directly to the page content, and begin reading the desired information. But for people who navigate by keyboard or with a screen reader, they must go through the slow, tedious process of tabbing through each link on the page before getting to the main content. Skip navigation allows them to skip all these links, just as a sighted reader can, and begin reading the page’s main content immediately. 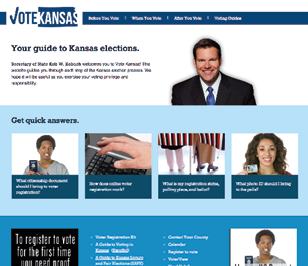 The home page for the Kansas Secretary of State’s voter registration site. With a good navigation system, a user with a disability can efficiently get to and use the desired content. Often, these skip navigation features are hidden from view until the user presses the tab key. 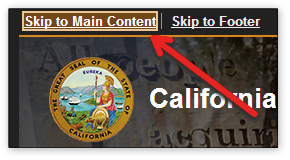 Another method, in this case used by California, is to keep the skip navigation feature visible for all users. A close-up of good use of a skip navigation link on California’s site. An “activated” skip navigation link on California’s site. California also makes it easier for keyboard users to identify when the focus has moved to the skip navigation link by having it change color. It is very easy to incorporate skip links, such as those used by California. However, it is important to place the skip links in the proper location. Ohio has tried to use skip navigation, but has placed the link incorrectly—users must scroll through all the navigation keys before getting to it, and then it does not bring the user to the main content of the page. This not only undermines the purpose of the feature, but also inadvertently makes the site less accessible. When websites include images, screen readers are unable to communicate the content or significance of the image to the user. Alternative text (or “alt text”) attributes are part of HTML web coding and provide a text description of the image that the screen reader can read to the user with a visual disability. The text description is usually visible while “hovering” over the image. “Alt text” allows a user with a visual disability to understand the meaning of the image. When the image is purely decorative or contains no content. The alt text should be entered as null (alt= “”),17 e.g., the gray figures in the heading of the page, with links to Business Services, Elections & Voting, etc. These images are useful to sighted users, but do not add any additional information to a screen reader and do not need to slow down the reader with a description. 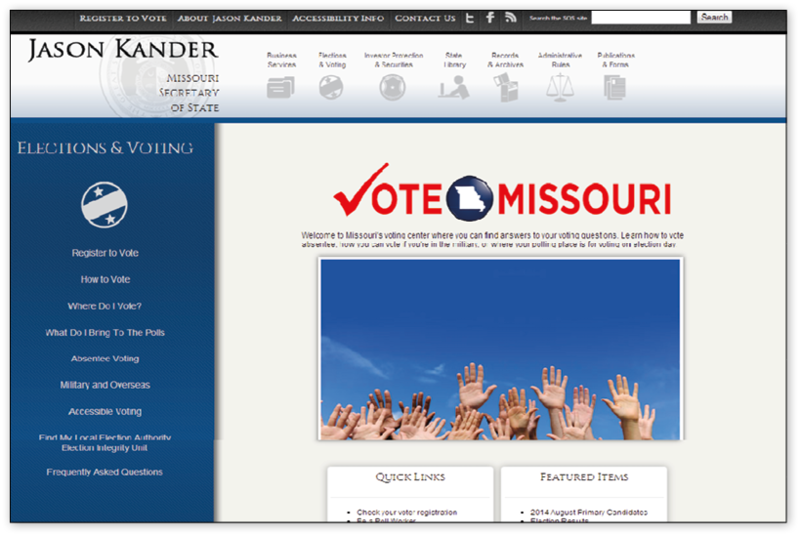 Incorrect use of the alt attribute on the Missouri site. Correct use of an alt attribute on the Minnesota site. In the image above, the alt attribute correctly describes the image and helps the user make sure that they are at the correct site. As a technical matter, adding alt attributes or word labels to images is very simple. To do this well involves a combination of common sense and an understanding of how screen readers function on a website. The programmer must work to convey the right amount of information and consider the relation of the image to nearby content. For a webpage to be accessible, all controls and content must be accessible via the keyboard using standard keystrokes. Keyboard access is a very important aspect of web accessibility, as it affects a large number of individuals with disabilities. Users who are blind do not use a mouse, and people with other disabilities, such as quadriplegia, carpal tunnel, or Parkinson’s disease, might not be able to control a mouse or use a touchpad. At the most basic level, all controls, menus, links, forms, and buttons need to be accessible via a keyboard. Users should be able to activate all controls via the tab and enter keys (to move through the page and activate page elements, respectively). Webpage authors need to be careful not to build sites that use unconventional keystrokes or keystrokes that might interfere with assistive technology commands. Where application-specific keyboard shortcuts are necessary, it is important to ensure that they can be turned off by the user. Ensuring keyboard accessibility is well within the capabilities of the people who designed and coded the existing voter registration sites. Any problems that exist are typically the result of a single element (out of many) on a page not being keyboard accessible. Thorough testing is important to make sure that all elements on a page are accessible. Adequate color contrast is particularly important for people with vision impairments, seniors, and those with reading disabilities. In addition, all users benefit from higher contrast. In fact, the higher the contrast, the higher the percentage of users that will be able to read text on the site. Utah’s website shows poor color contrast. Kansas’ website has both print that is too small and poor color contrast. Level AA of the Web Content Accessibility Guidelines (WCAG) 2.0 generally provides a level of accessibility that the Center for Accessibility supports. For color contrast, however, the WCAG AAA standard is preferable. Color contrast should be checked as early as possible in the design process. There are a number of free contrast checkers that evaluate two colors against the accepted web accessibility guidelines; CforAT recommends using the WebAIM Color Contrast Checker. the text and the background colors. In theory, choosing colors that have adequate contrast is quite simple. As mentioned above, there are a number of free programs that check contrast against guidelines and provide a clear pass or fail rating. We recommend involving all relevant stakeholders in the process when choosing appropriate colors. Individuals with a range of visual impairments need to be able to increase text size without having text overlap or disappear. CforAT recommends that no default text be smaller than the equivalent of 12-point font, and that all text on a website scale to at least 200 percent of the default without disappearing or overlapping other text. For example, Ohio’s website has a default text size for portions of the webpage that is too small for most seniors and is inaccessible to people with low vision. 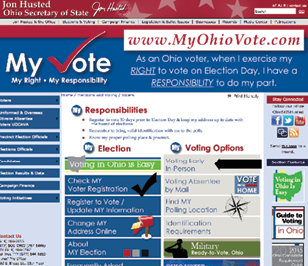 Ohio’s website with text that is too small. use other browser settings, such as Safari’s “Never use font sizes smaller than XXpt,” which overrides website font settings without zooming the page. prefer to zoom the text only, because browser zooming results in a lot of horizontal scrolling, which makes reading difficult. Tab order is closely linked with keyboard accessibility. In essence, when a user presses the tab key, the cursor should move in a logical manner. A major challenge for keyboard-only users is determining where they are on the page at any given moment. One way to make the experience more accessible for keyboard users is to ensure that the tab order follows the visual order. For English-language sites, this means the tab order should go from left to right and top to bottom. Appropriate tab order can be accomplished by setting the “tabindex” on every focusable element, but CforAT does not recommend this practice. Setting the “tabindex” almost always leads to code maintenance problems and frequently ends up making the user experience worse. The best way to implement good tab order is to ensure that the source order of the code matches the visual order of the page. New content added to the page will be in the correct tab order by default, and screen reader and sighted keyboard users will have a predictable experience navigating within pages. This was a high-level review of the voter registration websites. CforAT did not review every page and every detail on any site. The goal was not to capture each instance of a barrier, but to find the most common ones. Thus, the findings in this section are not a full-scale audit of any site. We recommend that states work with professional access experts in designing their websites and have professional audits of their existing websites to correct errors. While correcting the errors identified in this report would go a long way to increasing a site’s accessibility, we do not recommend that any state rely solely on this report as a complete review of its website’s accessibility. Good use of fieldsets, legends, and labels. None. The website had a high level of accessibility and usability. A perfect form from California. Note: Some elements were removed due to space constraints. Screen reader is not able to associate some instructional text with corresponding input fields. QR code image on step 1 is missing alt text. Blue hyperlinks on blue background. When using a screen reader, some input fields are not correctly associated with the corresponding instructional text. For example, under “Personal Information,” the “Name” text is not read by the screen reader. This may cause confusion for some users. There are other cases where the instructional text is correctly associated with the corresponding input field (see Figure 17). Use form fieldset and legend elements to improve accessibility. These are important features used by screen readers to associate instructional text with corresponding input fields (see Figure 21 in Minnesota analysis for a similar example). The CAPTCHA form is missing a label for the input field. The “Name” text is not read by the screen reader. Hyperlinks on the right side of some pages do not have an acceptable contrast ratio. WCAG 2.0 AA requires a minimum contrast ratio of 3:1. This example is 2.3:1. This may be an issue for some visually impaired users (see Figure 18 below). The contrast ratio is too low. There are many more examples of incorrect use of form labels in the HTML code. 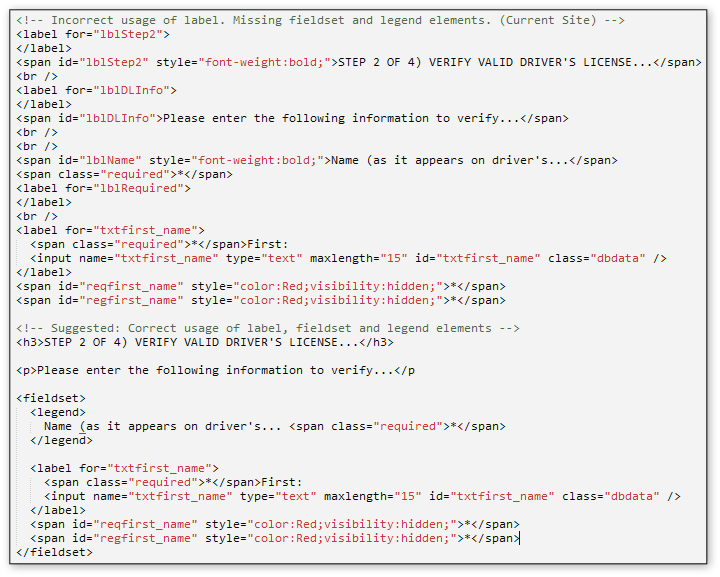 The majority of these issues are unmatched “label for” and “id” values. Screen reader is not able to associate instructional text with corresponding input fields. Incorrect use of HTML headings. While there is a skip nav feature on the entry page, there is no skip nav on step 1. Incorrect use of HTML headings. The <h1> element should come before the <h3> (see Figure 20). Use form fieldset and legend elements to improve accessibility. These are important features used by screen readers to associate instructional text with corresponding input fields (see Figure 21). Step 1 uses labels to associate instructional text with corresponding input fields. Step 2 does not use labels at all. 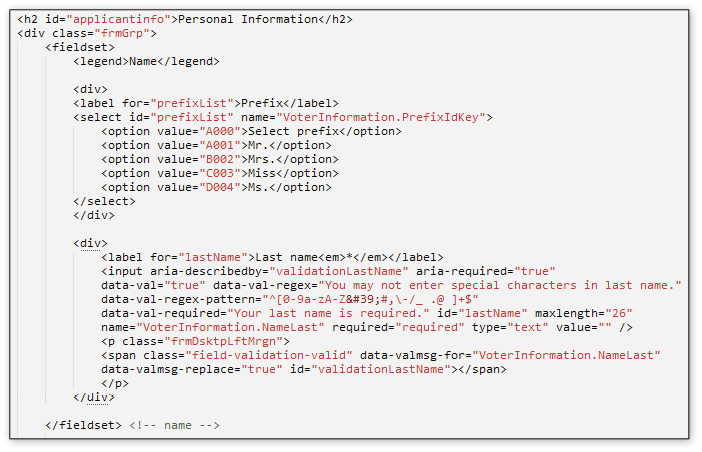 Example of using “fieldset” and “legend” HTML elements. No alt text in header graphic. Header graphic has poor contrast. 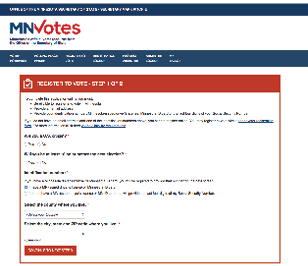 On the entry page (https://www.kdor.org/voterregistration/), form labels are being used even though there is no form on this page. This may cause confusion for screen reader users. Labels are being used incorrectly on all form pages (see Figure 22). Use form fieldset and legend elements to improve accessibility. These are important features used by screen readers to associate instructional text with corresponding input fields. One suggested approach is below (see Figure 22). Incorrect form and suggested corrections. The header image has no alt text and poor contrast (see Figure 23 below). Page header image is missing alt text and has poor contrast. No use of labels, fieldsets, or legends. Screen readers not notified of required fields. Completely inaccessible. In use, but in the incorrect location. When tabbing through page, there is a keyboard trap at the beginning of the form. Default text size too small. The skip navigation occurs after the primary navigation of the page. Skip navigation should be before all navigation. Furthermore, when clicking the skip navigation link, the focus should be the beginning of the main content. In this case, the focus is placed in front of the “Contact Us” link in the left column. Improper use of HTML “alt” attribute. Issues found include use of redundant text for a grouping of images (see Figure 24) and use of alt text for “spacer” images used for layout (should use alt “” for layout images). HTML headings should be used in the correct order (see Figure 25). The default text size for some areas of the page is too small. The increase/decrease font size feature on the top right of the page does not work for any of the navigation (see Figure 26). Page design is extremely cluttered. Incorrect use of “alt” attribute. An example of incorrect HTML headings. The default text is too small. Forms are completely inaccessible to some screen readers. There should be at least one HTML “h1” denoting the home page’s main purpose. Every page should have at least one HTML “h1” tag denoting the page’s main purpose. The pages on this website have none. In addition, headings are used by screen readers to navigate to different elements of the page. Identifying areas of content with HTML headings (levels 1–6) is an important accessibility feature. The forms are completely inaccessible to some screen readers. 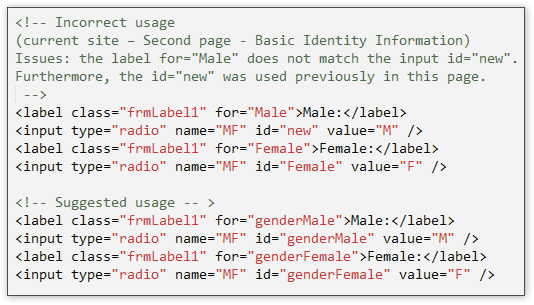 Because labels are used incorrectly, there is no association between many of the input fields and the corresponding instructional text. 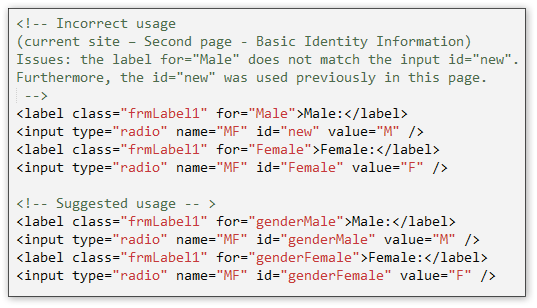 It is crucial that the “label for” value be identical to the corresponding input “id” value. This is how screen readers associate a label with the corresponding input (see Figures 27 and 28). Use form fieldset and legend elements to improve accessibility. These are important features used by screen readers to associate instructional text with corresponding input fields (see Figure 27 below). Form label example from Missouri. Additional form label example from Missouri. The third form screen (the sign and submit page) employs the HTML5 canvas element. 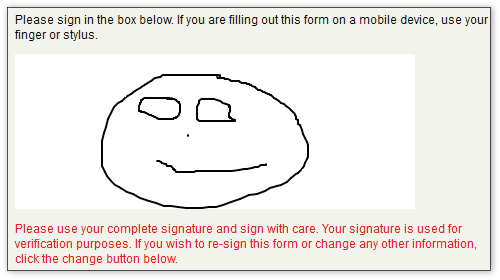 This feature requires a user to use a mouse to “sign” the document. It appears that this is inaccessible to keyboard and screen reader users. The page needs to include an alternative method of submitting the form. Furthermore, this feature may be difficult for users with motor coordination impairments (see Figure 29 below). An example of an inaccessible canvas feature. The measure of a webpage’s usability by persons with one or more disabilities. An accessibility statement provides information about the level of web accessibility for a website and the methods used to achieve accessibility. It also enables the website owner to recognize any areas of the website where accessibility needs to improve and presents a plan for resolving any access barriers; it usually provides a contact email and/or phone number for people experiencing access issues. PDF- or HTML-based forms that allow users of adaptive technologies to access the information, field elements, and functionality required for completion and submission of a form, including all directions and cues. Textual information that describes an image on a webpage. 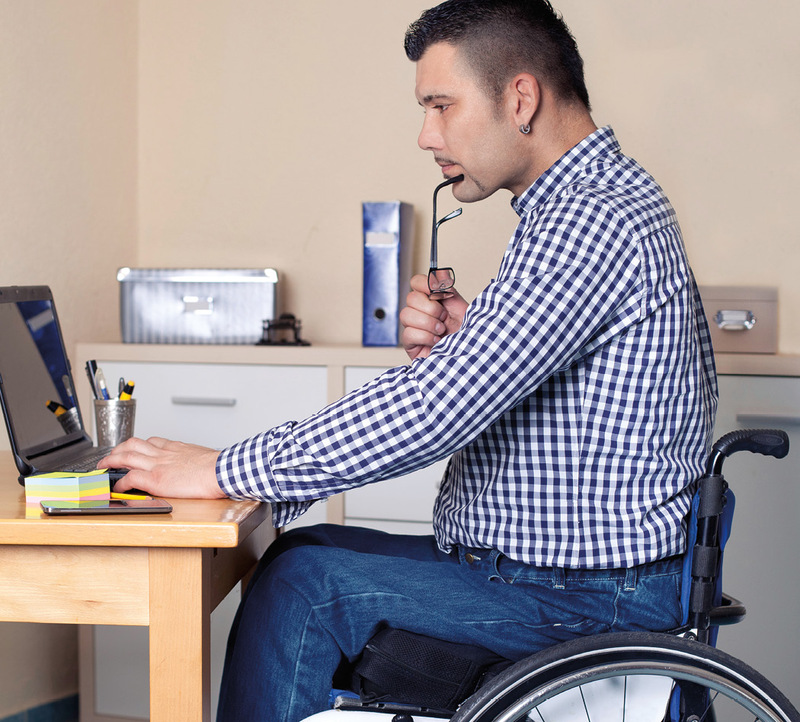 Any item, piece of equipment, or system—whether acquired commercially, modified, or customized—that is commonly used to increase, maintain, or improve functional capabilities of individuals with disabilities. Where the user’s focus is on a webpage. Generally represented by a dashed box that appears around items on the page and associated with tabbing. Also referred to as keyboard focus. A form field is a particular box within a fillable form that requests specific information. Examples include name, address, phone number, and signature fields, multiline text boxes, radio buttons, and check boxes. In PDF and HTML, heading tags are used as structural navigation aids to help identify the order of content. Within a PDF, adaptive technologies are able to search through the document for heading tags (H1, H2, H3, H4, H5, H6) that assist with skimming a document. 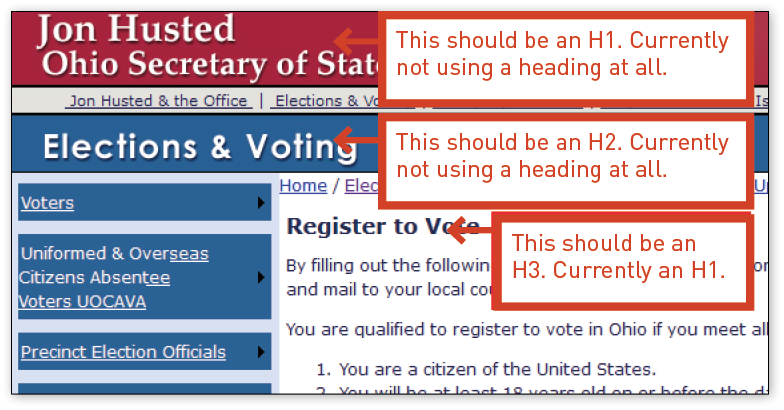 Most document designs should attempt to minimize the number of heading tag levels beyond Heading 3 Tag (H3), as many screen reader users do not anticipate that many levels. Semantic HTML is the use of HTML markup to reinforce the semantics, or meaning, of the information in webpages. Marking emphasis, citations, and loanwords in different ways makes it easier for web agents such as search engines and other software to ascertain the significance of the text. In the context of electronic documents and/or websites, inaccessible pertains to the difficulties an end user may face when trying to access content. Structuring that can lead to inaccessibility may include, among other things, lack of keyboard navigation, requiring the use of a mouse, small text, overlapping text, low-contrast color combinations, lack of alt text, distracting animations, or the lack of captions. Keyboard access allows users to access each “active” element in the portal with the keyboard. Keyboard accessibility is especially important for physically impaired and blind users who cannot use a mouse. All other users will appreciate this feature, too, especially advanced users who enter mass data or laptop users. Most web application pages contain forms that consist of labels and input elements, such as input fields. The labels are simple text elements that describe the input elements. With HTML 3.2, the World Wide Web Consortium (W3C) introduced a special label element to be used. This new element offers the advantage that an input field and its label are directly connected. The label’s attribute establishes the connection. Screen readers are then able to read the correct label whenever an input element gets the focus. Software that reads the content of a computer screen aloud. Screen readers read only text, so all graphics/images/etc. must have alternative text descriptions using alt text, captions, transcripts, or other methods. Two popular programs are NVDA (NonVisual Desktop Access), a free and open source screen reader, and JAWS (Job Access With Speech), which is produced by Freedom Scientific. Markup (such as HTML) that describes the meaning of document elements, as opposed to their appearance. Semantic tags include headings (<h1> through <h6>), lists (<ol>, <ul>, and <dl>), <strong>, and <em>. Non-semantic tags include <div>, <font>, etc. Skip navigation allows users to “skip” to different parts of a webpage to quickly get to the content they need. The most frequent use of “skip nav” involves jumping a page’s primary content so that a user does not have to go through repetitive header, navigation, and other common content design on a site’s pages. An assistive technology strategy. For people who cannot use a mouse, one strategy for rapidly scanning through links, headers, list items, or other structural items in a PDF or webpage is to use the tab key to go through the items in sequence. People using screen readers—whether because they are blind or dyslexic, for example—may tab through items on a page as well as people using voice recognition can. The Web Content Accessibility Guidelines (WCAG) is developed through the W3C process in cooperation with individuals and organizations around the world, with a goal of providing a single shared standard for web content accessibility that meets the needs of individuals, organizations, and governments internationally. WCAG 2.0 is a stable, technical standard, easily referenced. It has 12 guidelines that are organized under four principles: perceivable, operable, understandable, and robust. For each guideline, there are testable success criteria, which are at three levels: A, AA, and AAA. The World Wide Web Consortium is a non-profit organization founded by Tim Berners-Lee that is responsible for setting the standards for common web creation and access methods. Major documents include the specifications for the HTML and XHTML languages and the Web Content Accessibility Guidelines (WCAG). “Section 508” refers to Section 508 of the Rehabilitation Act. In reference to web accessibility, it usually refers to the standards outlined in § 1194.22: Web-based intranet and internet information and applications. These 16 standards were developed in 1998 and were specific to the web technology at the time. While some are still applicable, many are outdated. 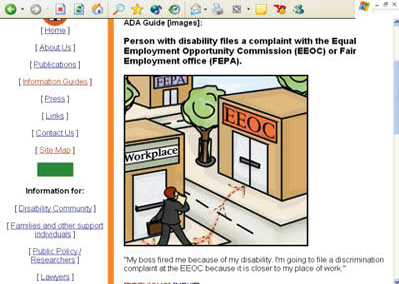 It is possible to have a website that is “Section 508 compliant” and still has many accessibility barriers. In addition, Section 508 is currently undergoing a “refresh” that will update it to be more relevant for today’s technology. The refresh will bring the web standards much more in line with the Web Content Accessibility Guidelines (WCAG) 2.0. For these reasons, CforAT recommends that all clients focus their efforts primarily on meeting the WCAG 2.0 guidelines and ensuring their content works for people using today’s assistive technology. The Web Content Accessibility Guidelines are designed to be much less technology-specific to account for unforeseen advances in technology. As a result, they are also more vague than the Section 508 standards. To assist website owners, designers, and developers with meeting the guidelines, there are a series of techniques described for meeting each guideline. These techniques are updated to reflect current technology. WCAG 2.0 provides for three levels of conformance: A, AA, and AAA. Level A represents the most basic level of accessibility, while AAA is the maximum level of accessibility. While CforAT advocates for increasing accessibility as much as possible, we recommend clients achieve AA conformance for most WCAG 2.0 guidelines, and AAA where possible. Level A conformance simply does not provide for accessible experiences, and AAA conformance can, in some cases, be cost prohibitive (though the costs would seldom be a hardship for government entities). Guidelines and standards are important to help web authors understand how exactly to build accessible websites. Guidelines are also immensely important in helping browser vendors, assistive technology vendors, and web developers converge on techniques that will work for users. Discover situations where an interface may work from a technical standpoint, but be inaccessible because of the order information is provided, or the language used to describe it. Keep up with the strategies users have for using the web, including common assistive technology settings, navigation strategies, and techniques for dealing with problem areas. Because of CforAT’s expertise in understanding how people with disabilities use websites, they also test against their own best practices to identify ways that improve the usability of websites for people with disabilities. Their approach has been refined through years of working both with organizations trying to improve their own site’s accessibility and through their Test Bank of users who are trying to access web content every day. One in five people eligible to vote has a disability. The changes needed…are both inexpensive and relatively straightforward. State and local governments must ensure they are not creating barriers…for people with disabilities. Multiple states now provide for online voter registration. 8.1 million Americans have vision disabilities. State governments are, as a whole, doing an abysmal job providing accessible voter registration websites. Forms are the most important portion of an online voter registration site. 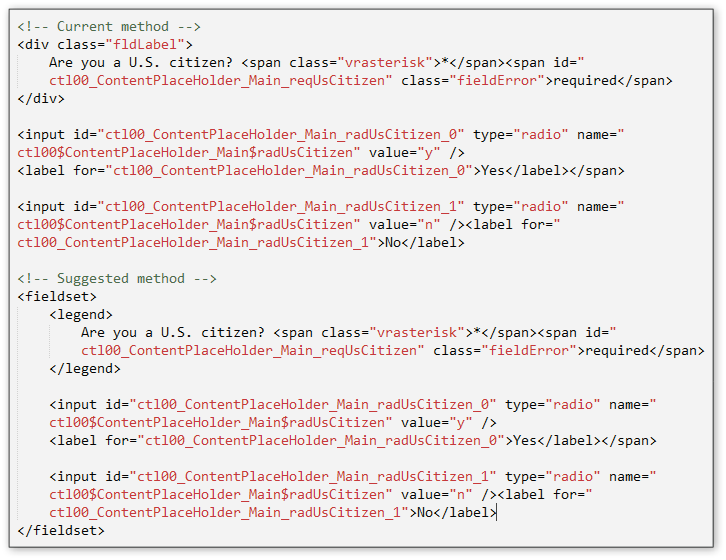 All users benefit from semantic markup. A missing “alt” attribute will cause unpredictable screen reader behavior. 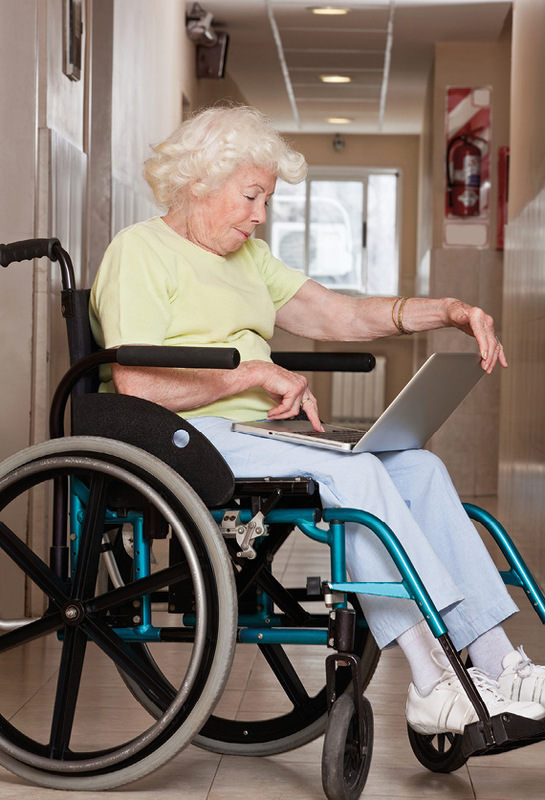 Keyboard access…affects a large number of individuals with disabilities. No default text should be smaller than a 12-point font. When a user presses the tab key, the cursor should move in a logical manner. The name label is not being read by screen readers. The “Home Address” label is being read correctly. 1. The American Voting Experience: Report and Recommendations of the Presidential Commission on Election Administration (Jan. 2014), available at https://www.supportthevoter.gov/files/2014/01/Amer-Voting-Exper-final-draft-01-09-14-508.pdf. 4. Sarah Burd-Sharps and Patrick Guyer, Social Science Research Council. The Cost of Modernizing Voter Registration Systems: A Case Study of California and Arizona (Jan. 2014), p. 12. On file with authors. 5. Matthew W. Brault, “Current Population Reports, Americans With Disabilities: 2010” (United States Census Bureau, July 2012), available at http://www.census.gov/prod/2012pubs/p70-131.pdf. 7. For a current list, see National Conference of State Legislatures, “Online Voter Registration” (Aug. 7, 2014), available at http://www.ncsl.org/research/elections-and-campaigns/electronic-or-online-voter-registration.aspx. 8. One important note: This was a high-level review of the voter registration websites. CforAT did not review every page and every detail on any site. The goal was not to capture each instance of a barrier, but to find the most common barriers. Thus, the findings in this report are not a full-scale audit of any site. We recommend that states work with professional access experts in designing their websites and have professional audits of their existing websites to correct errors. While correcting the errors identified in this report would go a long way to increasing a site’s accessibility, states should not rely on this report as a complete review of their website’s accessibility. 9. Sarah Burd-Sharps and Patrick Guyer, Social Science Research Council. The Cost of Modernizing Voter Registration Systems: A Case Study of California and Arizona (Jan. 2014). On file with authors. 12. For more detail, please see Appendix C.
13. Developed by Greg Kraus at the North Carolina State University. 14. As a comparison, the Harvard Law Review has a readability score in the low 30s, while Dr. Seuss’ “Green Eggs and Ham” has a readability score of 100. A score of 60 or above is considered to be a good goal for reaching the widest audience. In this instance, due to the inherent complexity of the subject matter, we considered a score of 50 or above to be a passing grade. 15. Find the jurisdictions and languages required here: http://www.justice.gov/crt/about/vot/sec_203/2011_notice.pdf. 16. “The Rules of Alt,” available at http://html.com/images/rules-of-alt. 17. An important rule: whenever an image or <img> element is included in a page, it must be given an “alt” attribute. Even when the alt attribute is null (alt=””), it is important to include the attribute. This should not be confused with omitting the alt attribute altogether. A null alt attribute will cause screen reader software to skip the image altogether. A missing alt attribute will cause unpredictable screen reader behavior. If the alt attribute is missing, often the screen reader software will attempt to read the image filename. This can be extremely confusing for users. here is growing consensus on the many advantages of online voter registration. 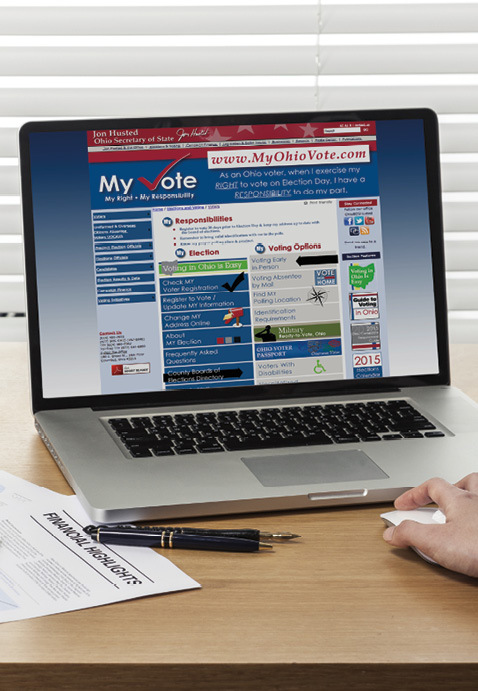 For eligible voters, an online voter registration system is quick, convenient, and accurate. Access Denied: Barriers to Online Voter Registration for Citizens With Disabilities focuses on one urgent issue: the accessibility of online voter registration websites for voters with disabilities. One in five people eligible to vote has a disability. Making sure these citizens can register to vote online removes the need for a time-consuming trip to the Department of Motor Vehicles, and is also required by the Americans with Disabilities Act.